Bring along some ID with proof of your residential address to any Hobsons Bay Libraries branch and we will get you started with your library membership. Public Access Computers and Internet Policy. Borrow up to 25 Items at a time. Books and talking books can be borrowed for 21 days. Magazines, CDs, CD ROMs, DVD can be borrowed for 7 days. You can renew your items twice, provided it is not on reserve for another customer. Reserve items via the library catalogue. Once ready for collection we will notify you by your preferred method and you will have 7 days to collect the item. Library membership is available at no charge, and there is no charge for most services and facilities including borrowing items, using PCs or wi-fi. Borrowing and internet use will be suspended if your charges exceed $5.00. Damaged or lost items will be charged a full replacement fee plus an $8.50 administration charge or an $4.00 administration charge for magazines. Overdue items attract a daily charge of 30 cents to a maximum of $6 per item. View the full list of fees and charges. * Reservations that are ready to be collected. * Courtesy reminders one day before items are due. * Overdue items that were due seven days ago. Please note that whilst we do offer reminders as a courtesy service it is the responsibility of all library members to ensure their loans are returned on time. Can I still borrow or use a computer if I don't have my library card? You sure can. If you have forgotten your library card, please just show us some ID with your current address. I don't know/can't remember my PIN? You need your PIN to reserve and renew items, and to login to PCs and wi-fi. To retrieve your PIN please visit any of our branches with your library card and ID. I joined at branch A, can I use branch B? Absolutely. Your card is valid at all five Hobsons Bay Libraries' branches, as well as online for all our online resources, eBooks, eMagazines and more. You can borrow from one branch and return to a different one, and reserve items to be sent to your nearest branch. Is there a minimum age for library membership? There is no minimum age to join the library, however anyone aged under 18 will need a parent/guardian or responsible adult to give consent for a new membership. Your library card is required every time you borrow, use our PCs or wi-fi, print or photocopy. A parent or guardian must be present to join a person under 18 years of age. If you lose your card please notify the library immediately. We will put a stop on your card, and a new card can be issued for a replacement fee. Internet membership is available for anyone without proof of Australian address, for use of PCs, wi-fi, eBooks and online resources. 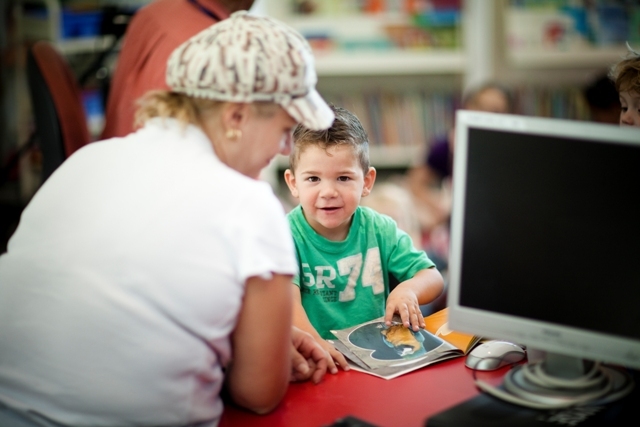 You can use your card at any branch of Hobsons Bay Libraries. Items can be returned to any branch of Hobsons Bay Libraries. Members are responsible for overdue charges incurred when material is not returned or renewed by the due date. Hobsons Bay City Council sets fees and charges. Members with charges over $5.00 may not access library services. All users will conduct themselves in a manner considerate of others, will not conduct illegal activities and will treat Council facilities with reasonable care. Members may not send, receive or display material that may be reasonably considered obscene or offensive. Members must comply with copyright legislation. Breach of conditions of use may result in a warning, followed by suspension of access, to library services. Significant breaches of conduct may result in immediate revocation of membership at the discretion of the Manager Learning Communities, based on type and impact of incident. Hobsons Bay Libraries does not disclose personal information for any purposes other than those specified in the Victorian Information Privacy Act 2000. Members understand that Hobsons Bay Libraries collect, uses and records personal and sensitive information for statistical and security purposes. Members are required to notify the library of change of address. Proof of address is required. Members are responsible for all material issued on this card, including loss or damage to library material or equipment. The guarantor is responsible for overdue charges, loss or damage to library material. The guarantor has access to all details and borrowing history of this card. · Reservations that are ready to be collected. · Courtesy reminders one day before items are due. · Overdue items that were due seven days ago.